White Ribbon Foundation in Australia has called on veterans from three football codes to speak out on violence against women in a print advertising campaign leading up to White Ribbon Day, November 25. Brendan Cannon, Jason Johnson and Gordon Tallis each talk about the embarrassment of wearing the uniform of an opposition team being nothing compared to the feeling they have when the look at the extent of violence against women in Australia. 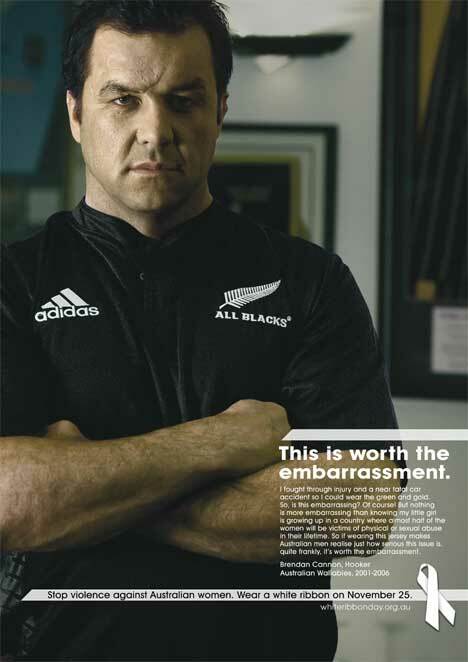 Brendan Cannon, former Wallaby rugby union player from 2001 to 2006, wears an All Black jersey. 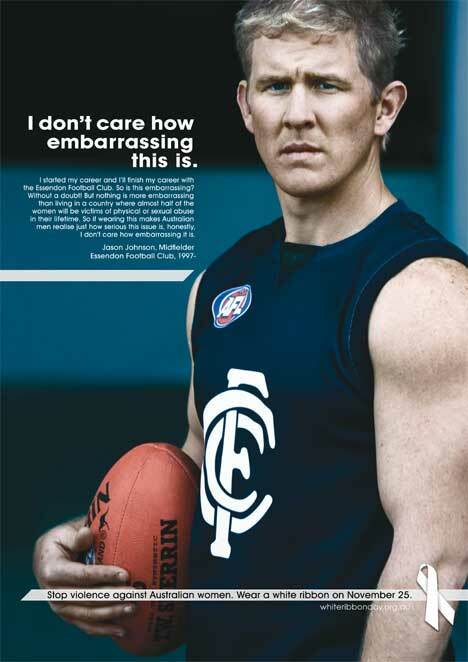 Jason Johnson, former Essendon AFL player, wears a Carlton guernsey. 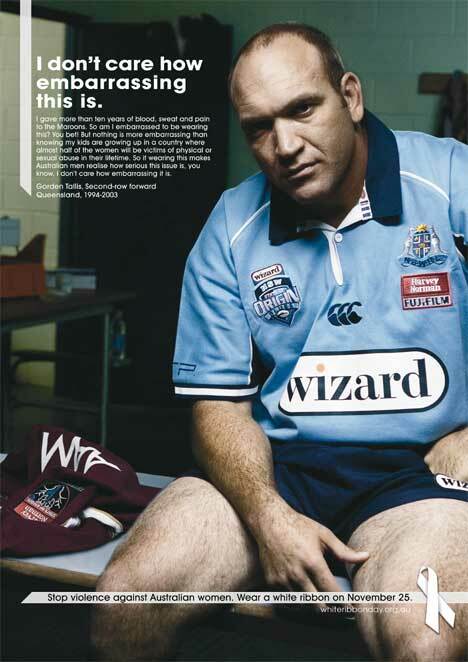 Gordon Tallis, Queensland NRL player normally in maroon, wears a NSW Blues jersey. Brendan Cannon writes, “I fought through injury and a near fatal accident so I could wear the green and gold. So, is this embarrassing? Of course! But nothing is more embarrassing than knowing my little girl is growing up in a country where almost half of the women will be victims of physical or sexual abuse in their lifetime. So if wearing this jersey makes Australian men realise just how serious this issue is, quite frankly, it’s worth the embarrassment. The Worth the Embarrassment campaign (three 30-second TVCs, three 30-second radio ads, three press and three magazine ads) was developed pro bono at Saatchi & Saatchi Australia, Sydney, by creative director David Nobay, copywriter Simon Armour, art director Shannon Sutherland.